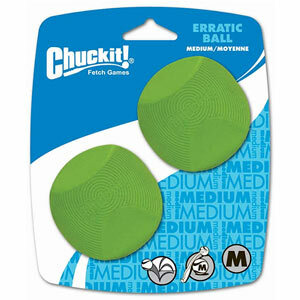 Erratic is a Chuckit ball with a fun, stimulating, random bounce that your dog will love. It is also Chuckit ball launcher compatible. 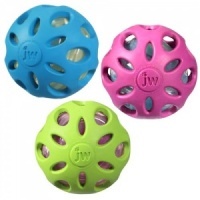 It is a natural rubber dog ball and easy to clean. Durable, tough dog ball. 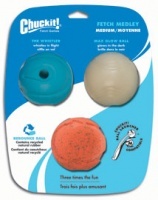 Chuckit balls are designed for the most demanding use. Erratic is no ordinary ball. 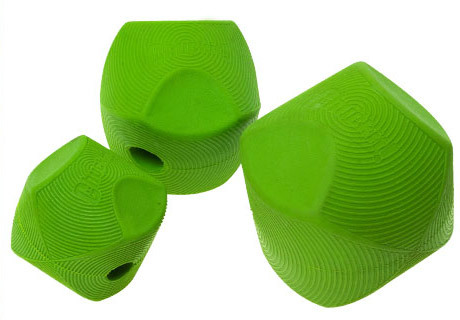 The unusual irregular shape gives it a thrilling random bounce that will keep your dog chasing around as Erratic careers off in all directions. 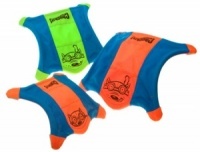 Available in size Medium 2.5" 2-pack. 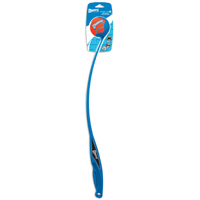 A great dog ball in its own right but also Chuckit ball launcher compatible for amazing games of fetch. 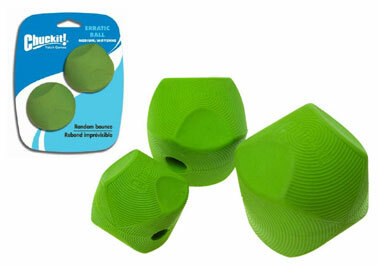 If buying Erratic Ball for a ball thrower, please check our size compatibility guide below. Puppy really enjoys chasing this and it's tough enough to stand up to the play. Good design and lots of fun. Our mutt has destroyed almost every toy we've ever given him, even the ones labelled as indestructible. We got him the medium chuckit erratic balls and he's not destroyed them at all, he likes to play with them on his own too which is a bonus. As they are so bouncy he can just drop it and watch it bounce away, then dives after it and the game starts all over again. Most definitely a 5 star toy!